www.incometaxindiaefiling.gov.in - Are you filling Income Tax Return Online? Then you now you can file your Income Tax Return online without digital signature. Earlier Income tax department of India only allowed to file online income tax return (ITR) via digital signature (in case if you don't have digital signature, you need to courier ITR form physically to Bangalore Income Tax office). But the good news is, now you can file online Income Tax Return because indian government (Income Tax Department) has provided more ways to e-verify yourself and file ITR (Income Tax Return) form online. Below is more information about Electronic Verification Code (EVC) by which you can verify yourself online and file income tax return online. What is Electronic Verification Code and how to generate it? Electronic Verification Code is unique code by which person or individual can verify his/her self to file income tax return online. Where will you need this EVC code? you will need this verification code for any kind of ITR filing i.e ITR 1 / ITR 2 / ITR 2A / ITR 3 / ITR 4 /ITR 4S etc. it is same like One time password (OTP) which we used in mobile payments. Once you link your Aadhar card number with ITR, you will get a code (EVC code) in your mobile number as SMS and file your ITR form. This is the same mobile number you registered with UIDAI (aadhar card), you will receive OTP on this number only. Yes, you can generate EVC code via net banking (which ever bank account use). Just login to your bank account online and find the option for 'file ITR online via online banking'. On that online banking site, and you will get options to e-file your income tax return via e-verifying yourself with mobile. Meanwhile, you will need to enter your PAN card number and file online Income Tax Return. You can use your ATM card (Bank Debit Card) with you have linked your PAN Card can be used to file Income Tax Return. You need to your ATM Pin card and select 'Generate EVC to file ITR online' option on your ATM Screen. (you will get OTP on your mobile). You can e-file your Income Tax Return via visiting official website of ITR at https://incometaxindiaefiling.gov.in/ and Generate EVC on that site after login to your account. Do remember that you can e-file ITR via official website if you have income below 5lac (<5lac) and no refund claim. 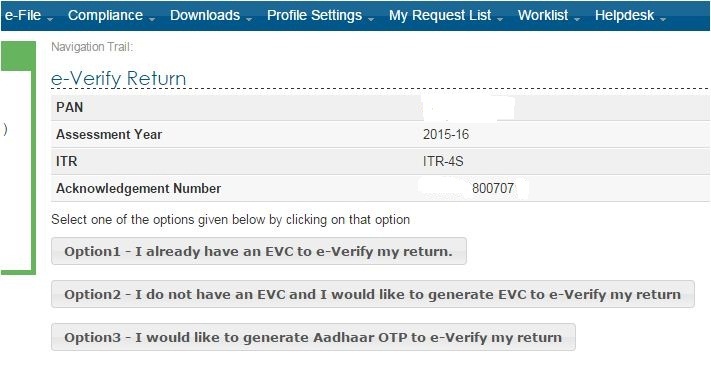 You can generate EVC (via below image option) and after getting EVC you can e-file your ITR online. 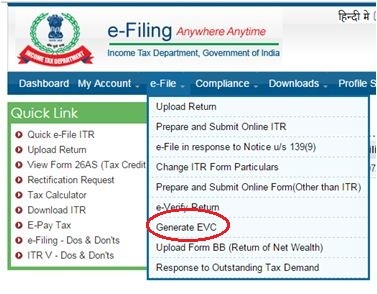 These are the ways you can generate EVC code online.Now check out process of e-verifying Income Tax Return. 1. First of all Login to official website of IT dept at https://incometaxindiaefiling.gov.in/ with your login details (email id and mobile number). 2. You will get option of e-verifying at e-file option for Income Tax Return file(as you can see on below image). 3. On that link you will get pending list of ITRs which is yet to e-verify, click on e-verify link (at right side). 4. You will get 3 options to e-verify your Income tax return, 1st for who have already EVC code, 2nd Generate EVC code and 3rd option Aadhar Card OTP and verify ITR. if you have EVC code you can enter it or you can link your Aadhar card (as mentioned above) to verify it. 5. You can even verify ITR via Net banking or get OTP on email and mobile number. we have mentioned email address and Mobile number above. 6. After selecting any option and getting verified, you will get confirmation of "ITR Successfully Verified". Thanks for reading long Article :D. Yes its quite easy and most important, its quite safe too. Do not have fear to get in trouble or something, you will get confirmation for everything. You can file your Income Tax Return for AY 2015-16 online using EVC code. Do try it, its quite easy and time saving. Thanks again.